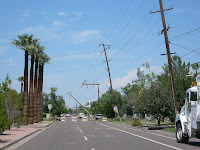 There was a huge storm in Phoenix Thursday night with winds clocked in excess of 100 miles per hour and a huge amount of rain and even hail (in August!!!). It started around 9:30 with an awesome lightening display. The sky was lit up in every direction and flashing in all different colors in a constant rythmic pattern with no lulls or dark periods. Colors of pink, green, and blue lit up the heavy churning clouds and the sound of thunder was a constant rumble vibrating the windows. Around 10:30 my power went out and stayed out until 4:30 this morning, but I consider myself lucky. As I’m writing this (Friday afternoon), there are still around 17,000 homes and businesses without power. This type of storm is very unusual for Arizona. 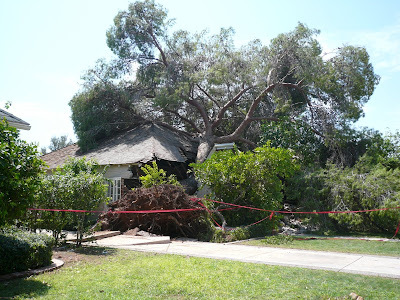 Yes, we do get those summer monsoon storms, but they only occasionally cause damage and rarely significant damage. I drove around town a little this morning and saw literally hundreds of trees either uprooted or snapped in two, a high-rise condo building with at least 12 to 14 condos with windows blown out, the power plant on the roof of that same building completely blown off and smashed into the street below, awnings torn to pieces, and finally this unlucky house pictured above in the top photo. I spoke to a neighbor of this home when I took the picture and found out that no one was hurt, however the people living there had just walked out of their living room when the tree fell. The living room is a complete loss. In fact the whole front of the house is laying in the yard (under the tree) in piles of bricks. I have a whole new empathy for all of you who must contend with tornados and hurricanes all summer long. The power of nature is awe inspiring thing. I’ll be away over the weekend and won’t be able to see your comments until I return on Monday. Amazing photos, Sharon. And what a storm. By the way, in response to an earlier post someone made a comment wondering about about Phoenix being in a desert. 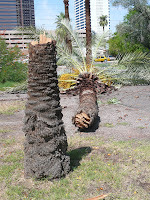 Yes, it is a desert outside the city, but your photos show that the vegetation in the city includes lawns, shade trees, etc., but obviously the trees were no match for a desert storm. Wow, I guess they couldn't squeeze this info into our local news last night!! Glad you are okay! I had no idea this happened with Gustav dominating the news. I'm glad the house inhabitants are safe. What a storm. Wow. I grew up in Texas where storms can be fierce and deadly. I remember the nights of lightening like you described. It's awe-inspiring and terrifying at the same time. Wow! 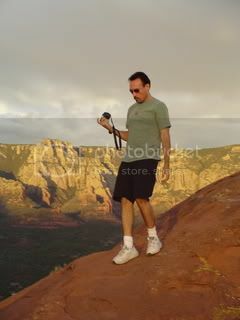 Incredible photos! I really feel for the people whose house was hit. Nature really knows how to exert her authority. Wow, I used to live in Willo. Just down the road from where those polls fell. It must have been a really bad storm.